Check contacts, validation rate of change of the charge air temperature. High or low temperature, poor contact of the signal line, the wrong signal. 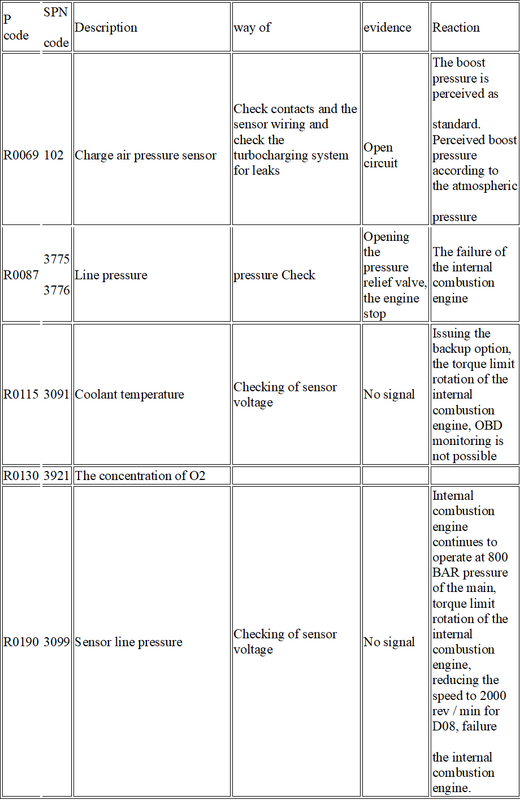 contacts check validation rate of change of the exhaust gas temperature. High or low temperature, poor contact of the signal line, the wrong signal. OBD monitoring is not possible. Check for an open circuit and the power supply wires and the masses. Circuit, there is no signal. The engine continues to work with 800 BAR line pressure, torque limit ICE rotation failure of the engine. Charge air pressure regulator Charge air pressure value can not be adjusted. Constant control deviation. ICE torque limit rotation failure of the engine. Circuit, there is no signal. Imitation of the charge air pressure in an equivalent electrical failure. Checking of sensor voltage Circuit, there is no signal. 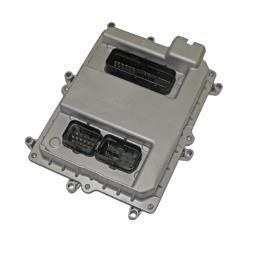 OBD monitoring is not possible. Checking on the output stage circuit and for open wires and power supply. Circuit, there is no signal. The output stage is disabled, internal combustion engine speed is reduced, an electrical failure. Circuit, there is no signal. The output stage is turned off, the ICE operates with a line pressure of 800 BAR, the internal combustion engine rotational speed is reduced, the torque is limited to the internal combustion engine, the failure of the engine. Checking Line Pressure increased. High Line Pressure defies regulation. Not Available return flow of fuel is possible to open the pressure relief valve, the failure of the engine. Check the valve opening. Line Pressure 600 to 800 BAR, limited ICE torque is limited by the frequency of rotation of the internal combustion engine. Checking of sensor voltage. Circuit, there is no signal. OBD monitoring is not possible. The correctness of readings comparing the differential pressure of exhaust gas sensor Checking low pressure at the working engine. Checking the two different fixed values ​​of the charge air and exhaust gas pressures. Accuracy of temperature sensor readings exhaust gases. Check sensor readings deviations when switching off the internal combustion engine (gas temperature should drop to ambient temperature). Check throttle position. Circuit, there is no signal. Id temperature AGR Checking the authenticity of the recirculation of exhaust gases at a temperature of the charge air before AGR and the charge air temperature in the middle of the intake pipe. The gas temperature in the intake manifold above the gas temperature before the AGR. AGR Checking deviation value AGR controller with adjustable position. The position deviation from the norm. Checking circuit from the injector to the DVS control unit. Circuit, there is no signal. FMI4 wiring breakage, there is no signal. FMI1 circuit or other electrical fault. №6, 8-cylinder internal combustion engine: the cylinder №4 main cylinder №8 slave) Checking circuit from the injector to the DVS control unit. Circuit, there is no signal. FMI4 wiring breakage, there is no signal. Pressure check. Circuit, there is no signal. Disconnecting the injector. Sensor speed. Checking speed sensor camshaft and crankshaft. Wrong signal. EDC inertia phase is not completed. Verifying the completion of the last two freewheel. OBD monitoring is not possible. R1509 3671 EDC failure when reading a non-volatile memory (EEPROM) Checking reading procedure. The checksum is not correct. Check CAN2 Missing or wrong signal. Defective component. CAN2 Checking off the output stage injectors. Circuit, there is no signal. Checking device for monitoring overvoltage. Device for monitoring overvoltage EDC unit is not properly. The output stage is disabled EDC. stage verification. overstrain or serviceable safety line. Checking speed signal. Missing or not the right message. Polarity is not correct. Electrical malfunction. ICE works only with the crankshaft sensor. R1519 3754 The signaling device is not properly during system startup. The device is not properly. The internal combustion engine is switched off. Determining the SCR catalyst. Check for smoke sensor exhaust gases. If the temperature is low, then the sensor does not smoke detector.) This temperature is insufficient to the load. 3794 exhaust gas temperature sensor after a posttreatment. Checking of sensor voltage. Circuit, there is no signal. Failure exhaust system. Checking of sensor voltage. Circuit, there is no signal. Check for messages. CAN3, the response timeout.